This is a project I’ve wanted to do for a while now, to create an Ambigram. An Ambigram is a word or phrase that can be viewed in multiple orientations. Some read the same when rotated, some present a completely different word. 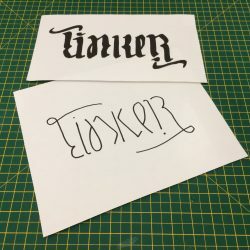 In this video, I show you how I created my own TINKER Ambigram and give you the tools you need to be able to go about creating your own.